A new “documentary” directed by the world’s most famous street artist is just another of his signature ruses. In the summer of 2008, I saw an article in the LA Weekly about a massive street art show mounting in L.A. named Life is Beautiful. On the outset the show seemed ambitiously cool. The 125,000-square-foot show was being staged in CBS’ abandoned Columbia Square Studios, a massive modern office complex where I Love Lucy was filmed. The artist, Mr. Brainwash or MBW, was an up-and-comer who had already plastered the city in his likeness, as a guy holding a video camera. And the timing for such a spectacle could not have been more perfect: Artists like Shepard Fairey had illegal works dotting same blocks as their gallery-installed shows, and we were all still talking about the dusty downtown warehouse vandalized by Brit street art phenomenon Bansky two years ago. But something here seemed off. The clichés. The rip-offs. The triteness of a Campbell’s Soup can crossed with a spray-paint can. All the Warhol references. The name “Mr. Brainwash.” And most of all: Ringing endorsements for the show from the two most famous street artists in the world, Fairey and Banksy. The new “documentary” Exit Through the Gift Shop, “directed” by Banksy, and “co-directed” by Shepard Fairey, takes that prank one step further. 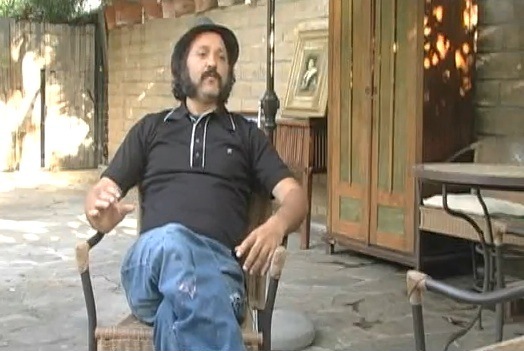 Ostensibly, Mr. Brainwash, whose real name is Thierry Guetta, was a French-born ex-pat living in L.A. who had been attempting to make a documentary about street art when he came in contact with Banksy. The outrageous plot of the film is that Banksy was so horrified by Guetta’s would-be movie–there’s even an over-edited, bad “first cut” of the movie shown–and so fascinated with Guetta, that he turned the cameras on him, only to be completely blindsided when Guetta ripped off his style. That’s what the movie says. 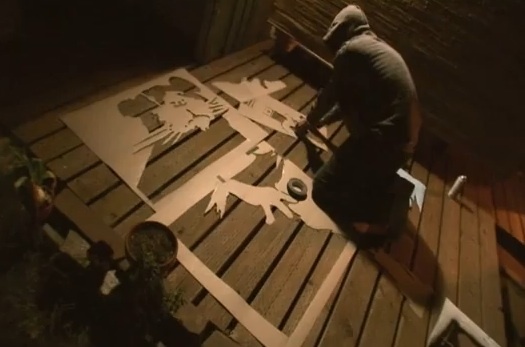 But what really happened is that when Banksy did encounter the filmmaker, he convinced Guetta to pose as a budding graffiti artist wannabe so he and Fairey could “direct” him in real life–manufacturing a brand new persona that both celebrates and criticizes the over-commercialization of street art. Then there’s the film plot’s central concept: Banksy and Fairey both say they were so grateful to Guetta for documenting their highly illegal, middle-of-the-night work as street artists that they bended over backwards to help with his art career. But neither artist has ever had a problem attracting would-be documentarians. Quite the contrary. 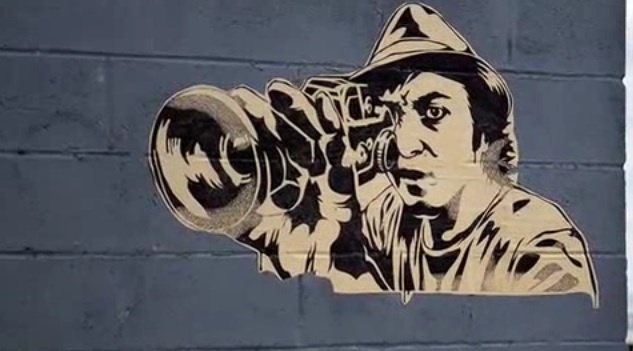 New work by Banksy that was put up in L.A. this week attracted camera-happy fans within hours. And there’s plenty of footage (even in the movie) of Banksy’s own people documenting him working on walls in the West Bank, before he ever met Guetta. Additionally, we’re spoonfed bizarre, effusive comments in the film about how famous Mr. Brainwash is, how his career has totally eclipsed that of Banksy and Fairey. This was echoed by Banksy in a recent email interview with the LA Weekly, which can only be read with tongue-in-cheek: “I continue to find the rise of Mr. Brainwash absolutely fascinating. His art sells for roughly double what mine does these days.” Banksy’s Space Girl & Bird went for a little over $500,000. So Mr. Brainwash, an artist that most people have never heard of, makes work that goes for a million? As a straight documentary, this film is a snoozefest, an artist’s love note to himself written in spray paint on a public wall. 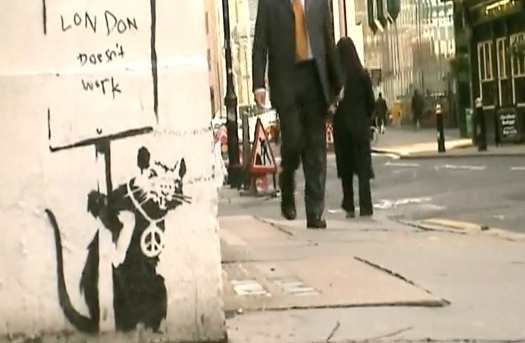 But Banksy isn’t quite a straight-ahead kind of artist. He’s a character based on surprise and coyness, someone whose work catches us where we least expect it, hours after he’s fled the scene. And as another of his ruses, Exit Through the Gift Shop is as fun and well-conceived as the Banksy persona itself.